There is some jute netting for erosion control placed on both the East Highway 101 and West Highway 101 construction sites, where the receiving and jacking pits have been backfilled and all work is complete. All construction equipment has been demobilized. 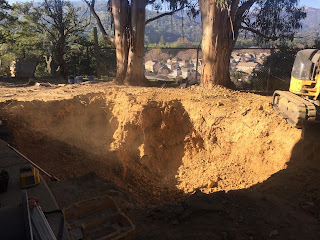 The contractor has finished all project work as of November 30th, and the project will be officially closed out in December 2017 by the North Marin Water District. The contractor has ensured that work shall only take place during working hours, which are 8:00 AM to 5:00 PM, Mon.-Fri. and if special approved is granted, 10:00AM-5:00PM on Saturday. No Saturday work is anticipated for the remainder of the project. The vault excavation is complete, and the vault along with all necessary piping will be placed on 12/9/17. This is the bulk of the work left for the project, leaving only site grading and miscellaneous items to be performed. The contractor will be finishing up all project work by the end of December 2017, after which the project will be officially closed by the North Marin Water District in January of 2017. A few hours will be spent at Plum St tank (at the end of Zandra Pl). This involves swapping out a valve for a motorized valve and this work is scheduled for mid December. After this is complete, no more work will be performed on Zandra Pl. for this project.